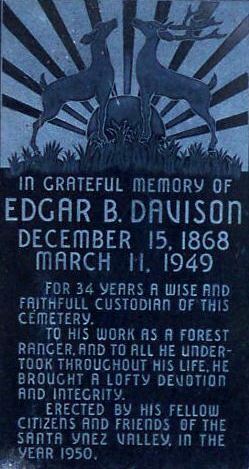 Edgar B. Davison was active in civil society and described himself as being “proud of California, and a deep-dyed optimist as concerns her future.” He was a proactive citizen that helped build the state into what it is today. The son of pioneers, he was in many ways a pioneer himself as an early resident of Ballard in the Santa Ynez Valley. Edgar B. Davison helped build the town church and school and worked as the first manager of Ballard’s Oak Hill Cemetery, which was founded in 1883, and within which today still grow several towering redwood trees he planted. Davison participated in party politics and in 1898 was elected a delegate in the Republican county congressional convention. 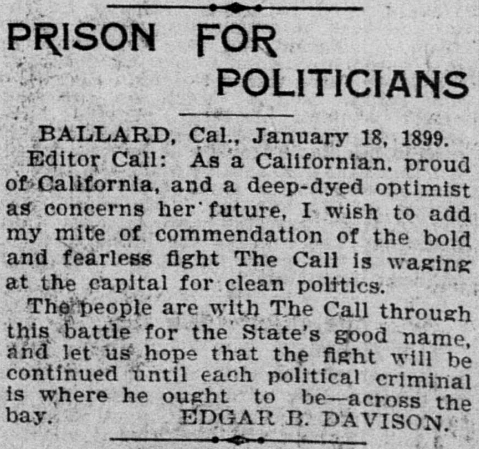 The next year the San Francisco Call published a letter he wrote commending the newspaper for its “bold and fearless fight” against political corruption in California. In 1911, President Taft appointed him postmaster of Ballard. Memorial plaque at Oak Hill Cemetery. Aside from his work within the Ballard community, one of his more enduring legacies enjoyed by countless outdoor enthusiasts and hikers through the decades was the protection of a mountain reserve that eventually became part of the Los Padres National Forest, as well as the building of Davy Brown Trail. 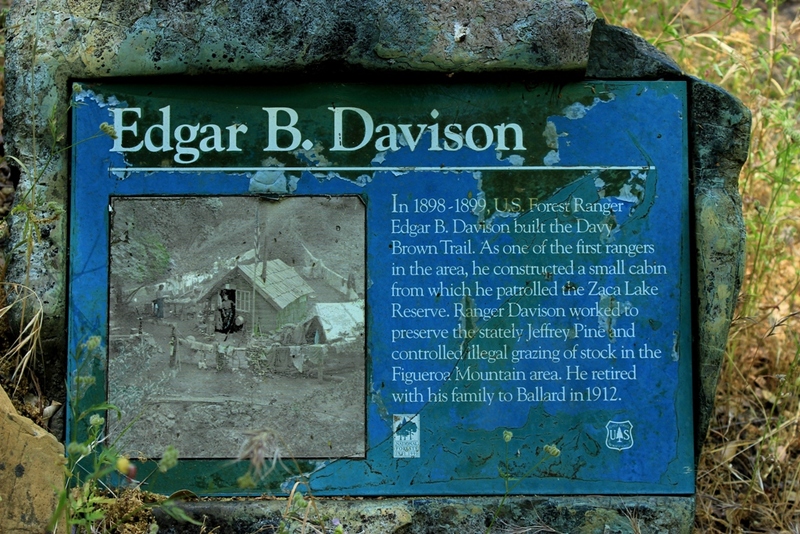 Davison created the Davy Brown Trail between 1898 and 1899. The three mile path leads down the backside of Figueroa Mountain (4528′) to Sunset Valley and what today is Davy Brown Campground (2095′). 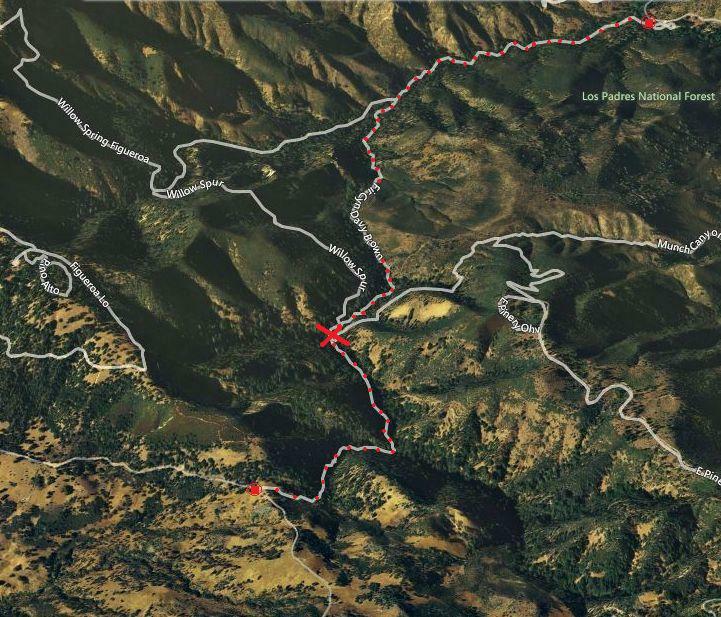 During the same period of time around the turn of the century, Davison was actively involved in laying the groundwork for what would become the Zaca Lake Forest Reserve, which eventually became incorporated into what today is known as the Los Padres National Forest. On September 25, 1898, the Los Angeles Herald offered readers an illustrated feature story about the new forest reserve, which praised Davison for his conservation work. 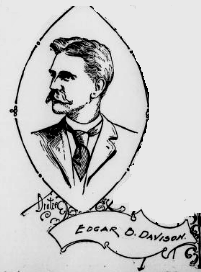 Edgar B. Davison, who has done as much as anyone else to procure the reserve for Californians, is a young man, a resident of Ballard, near the reserve. He is 29 years old, and has lived near or on the tract for fifteen years past. Pleasing to state is the fact that his zealous efforts to secure the state a splendid reserve have not been unrecognized at headquarters. Mr. Davison is now one of Commissioner Crawshaw’s assistants, and has his headquarters in Brown’s cabin, on the Little Manzana. Davison became one of the first forest rangers serving in Santa Barbara County. 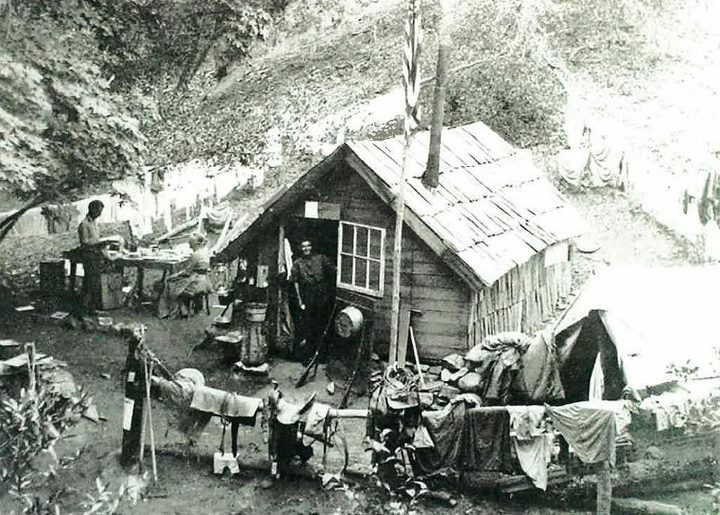 He used the Fir Canyon cabin on Davy Brown Creek as a station for his duties, as well as using the cabin built by C.E. Munch in what today is known as Munch Canyon for his winter headquarters. Neither structure still exists. Today, along the Davy Brown Trail, a plaque notes the location of the old Davison cabin. The Edgar B. Davison cabin site in 2012. 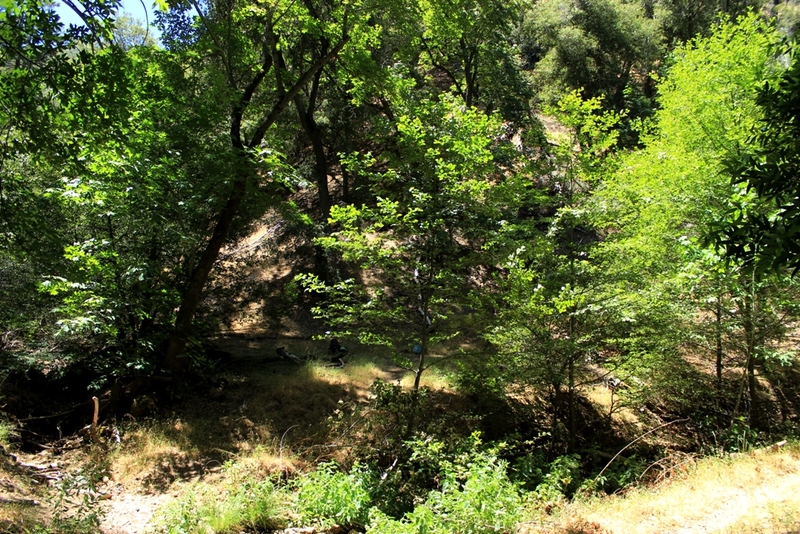 The above shown green plaque can barely be seen in the shadows just below center frame and to the left of the thin trunk of the tree. The “X” marks the location of the old Edgar B. Davison cabin. 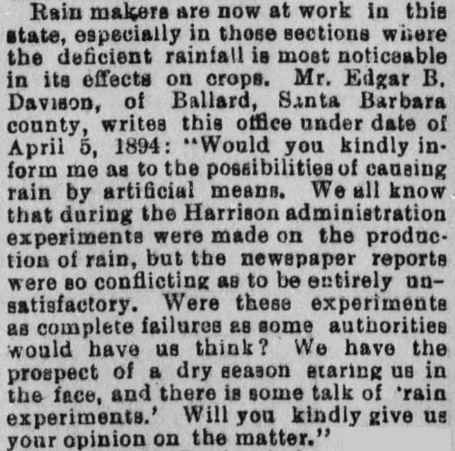 This entry was posted in Santa Barbara County and tagged Ballard, Davy Brown Creek, Edgar B. Davison, Figueroa Mountain, Fir Canyon, History, Los Padres National Forest, Non-fiction, Photos, Pics, Santa Barbara National Forest, Zaca Lake. Bookmark the permalink. Jack, I love that you include historical information, it adds perspective to those of us who work to protect the forest and enhance its worth as a wilderness area. A lovely hike, especially if you can get a friend to pick you up at the bottom. Well done, keep up the good work. Hello William. Thanks for stopping by, and thank you for the kind words. Thank you for this wonderful article about my great grandfather! I’ve shared it with other family members, as well as on my Facebook page.